There’s something very exciting about products that come in massive boxes. A big TV, a cool bicycle, or even a smart refrigerator. It’s fun getting inside, and fighting through all the packaging. 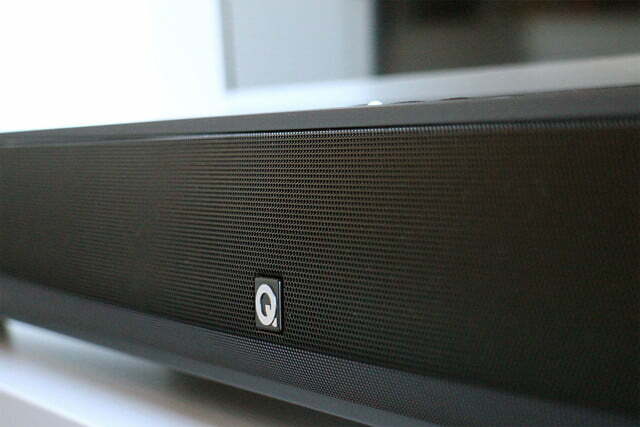 The Q Acoustics M4 Soundbar is exactly one of those products. 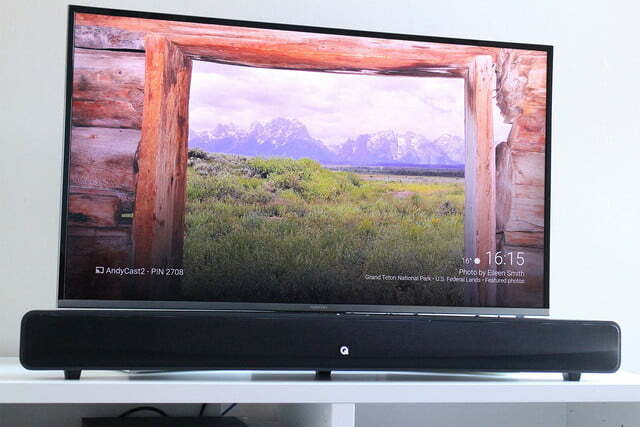 The box, as you’d expect, is oblong and tall, yet it contains only a soundbar, not a subwoofer to go along with it. 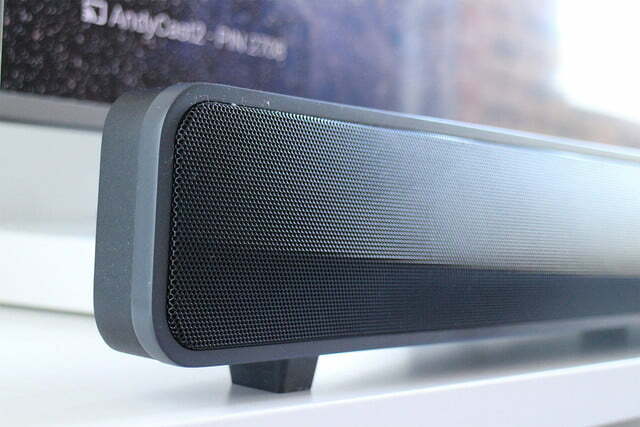 We recently unwrapped one of these monster soundbars and listened to it over a weekend. Is the fanfare of unwrapping this beast representative of the sound? Let’s make one thing clear immediately. 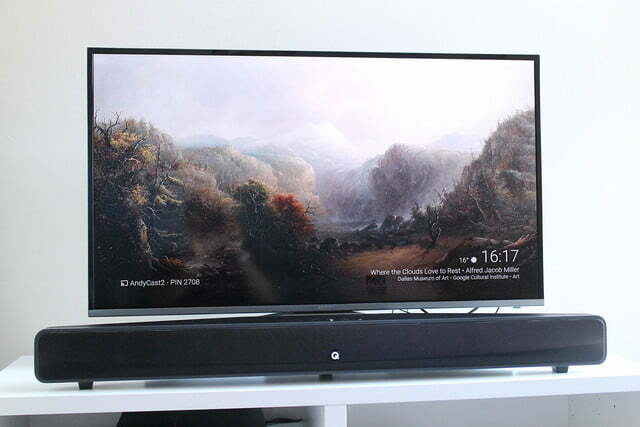 This is a big soundbar. 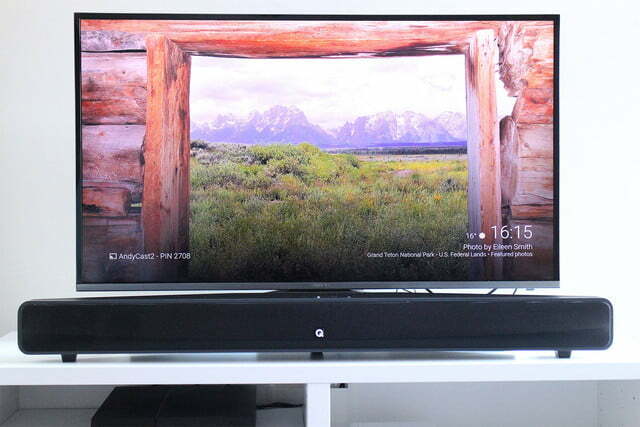 At 39 inches wide it outstretches this reviewer’s 40-inch Samsung Ku6400 television, and it’s 4.5-inch height stretches over the stand, meaning the television needs to be elevated to stop the M4 obscuring an inch or so of the screen. This is compounded by the M4 sitting on its own little sound-isolating rubber feet, which have to be screwed into the base. A wall mounting plate is included in the box, if that’s an option for you. It’s not all that shapely either, with sharp angles and a plain-Jane grille over the speakers. On the top are just three buttons for power and volume control. The whole thing feels exceptionally solid, and the MDF cabinet gives the M4 a real quality feel. This is let down by the remote control, a small credit card-style sliver of a thing made from plastic, with one of those horrid plastic membranes over the buttons. It feels like it’s in the box as a courtesy, and thankfully the M4 can be linked to a compatible multi-device remote if you have one. 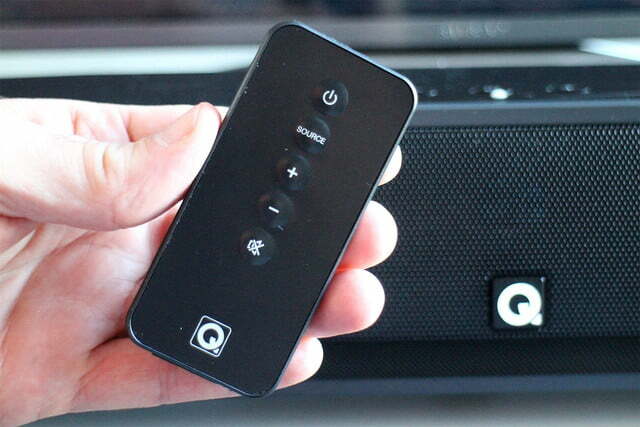 No one buys a soundbar for the remote. You’ll buy the M4 for the sound. The amplifier inside pushes a claimed 100 watts, driving dual 2.5-inch Balanced Mode Radiators with 25-watts of power each. That leaves 50-watts for the bar’s downward-firing twin coil subwoofer, which measures four-inches by six-inches. 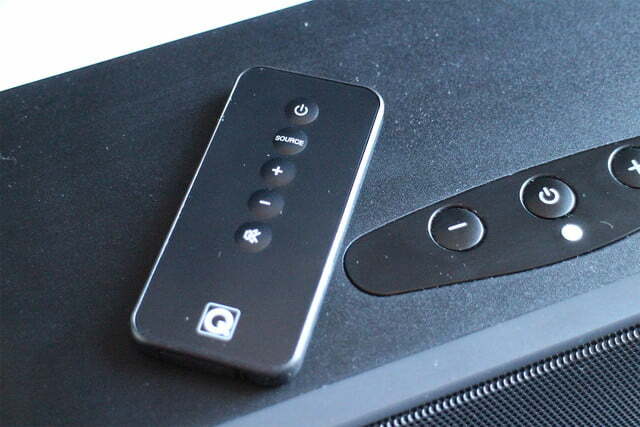 The system offers basic 2.1 channel audio, meaning there’s no center channel, and there’s also no virtual surround. 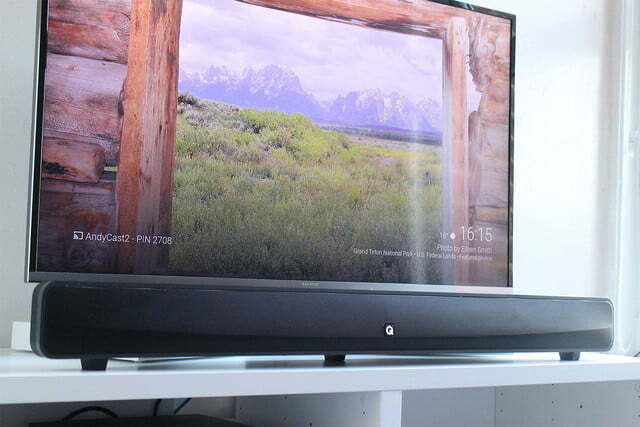 That’s not what you’d expect from a soundbar these days, but it works thanks to the BMR speaker system’s talent for dispersing sound over a wide area — a massive 180 degrees, according to Q Acoustics. Never once did we feel the need to angle the soundbar, or that we were sitting in entirely the wrong position for optimum performance. It really works. We chose a corner to place the TV and soundbar to test the M4’s prowess here, facing it forward into the other corner of the room, then deliberately sitting way off center to listen to music, movies, and TV shows. It simply didn’t matter. The M4 pushed the sound in our direction, and never once did we feel the need to angle the soundbar, or that we were sitting in entirely the wrong position for optimum performance. The M4’s sound quality itself is also impressive. Listening at moderate, regular volumes is comfortable, and the sound is well balanced. Dialog is never shoved to the back of the soundstage, or overpowered by other elements, which sadly comes part and parcel with many cheap virtual surround sound systems. Give the volume a push and the bass starts to come through. The wonderful score to Stranger Things sizzles, and the many battles in Star Wars: The Force Awakens are matched with suitably raucous and action-packed audio. It’s a vast improvement over flatscreen TV speakers. What’s really pleasing is the M4’s everyday usability. It sounded great regardless of what we played, offering a focused, powerful, and delightfully composed performance when the volume gets really loud. While television will likely be its main function, the M4 is extremely musical. In fact, this is where it sounded its best, and to not utilize the Bluetooth connection to stream music would mean missing out on its talents. Unlike most brands on the market, Q Acoustics has chosen not to use digital sound processing to change the way the soundbar performs, and it’s all the better for it. 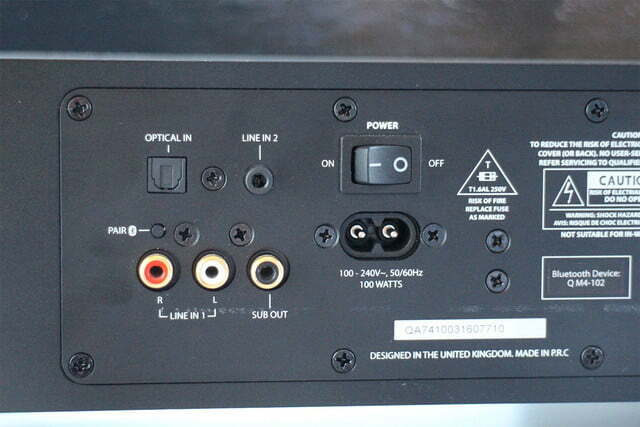 In addition to the aptX Bluetooth connection, there’s an optical TOS link connector and a set of analog RCA connections for hooking the M4 up to your TV. If you want more bass, there’s an RCA out for a separate sub. Contrary to most newer sound bars, there’s no HDMI, but given the system’s limitations in decoding Dolby or DTS codecs (it doesn’t), that’s not really an issue. It’s not perfect, though. We’ve already mentioned the flimsy remote, and it’s disappointing there’s no on-screen indication of volume level when using the optical TOS connection. While we loved the system for music playback, the M4 would suddenly connect to our smartphone and stop playing audio from the TV on occasion. This often happened simply when a notification came through on the phone, because the M4 gives Bluetooth priority. It forces you to go to the settings menu on your phone and manually disconnect from the bar, or find the M4’s remote and change the source. The overall size and bulk also means it won’t be suitable for all rooms or TV stands, so make sure you measure well before getting one. Q Acoustics sells the M4 soundbar in the U.S. for $380, and in the U.K. for 300 British pounds. It’s available direct from the company, or through Amazon. 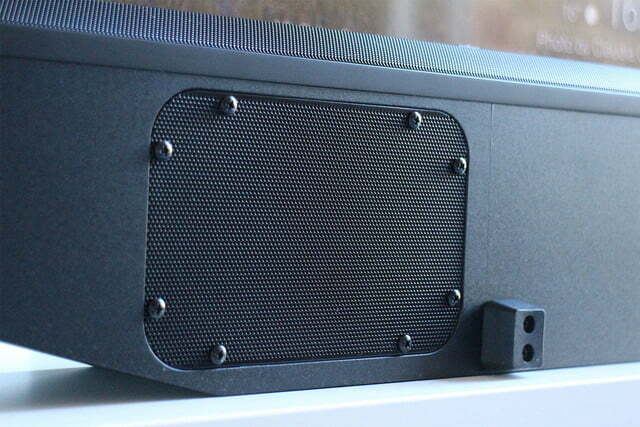 The M4 is less of a soundbar and more of a hi-fi audio system in a more convenient package. It’s not a replacement for a 5.1 setup, and if you’re looking for virtual surround sound effects, look elsewhere. The M4’s strong suit is delivering powerful, sweet sounding audio with a hefty bass line that’s highly enjoyable. It’s a well-rounded audio system that is tuned to impress whatever you listen to, and from wherever you are in the room.